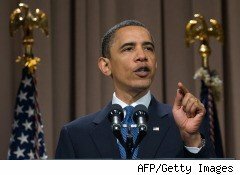 It's no surprise financial services companies aren't happy with President Barack Obama's tough speech at Cooper Union in New York yesterday calling on them to support his financial reform efforts. Big Wall Street companies whose officials attended the President's speech largely declined to comment. Among them were Morgan Stanley (MS) Chief Operating Officer Tom Nides and Chief Financial Officer Ruth Porat, Credit Suisse (CS) Investment Bank Chief Executive Officer Paul Calello, and JPMorgan Chase (JPM) Chief Risk Officer Barry Zubrow. Goldman Sachs (GS), which was represented at the speech by CEO Lloyd Blankfein, responded to Obama's criticism that Wall Street is fighting reform by saying, "We have consistently been in favor of sensible bipartisan financial services reform." The Securities Industry and Financial Markets Association issued a polite statement from President and CEO Tim Ryan: "We share President Obama's urgency to get bipartisan regulatory reform passed." But, Ryan said in the statement, "while we disagree on some of the details -- specifically on the Volcker rule and aspects of the derivatives portion of the legislation -- it should not distract us from our overall shared goal of passing responsible reform." But one industry lobbyist, who would not speak for attribution, was bluntly critical of Obama. "He completely demagogued the industry. I don't know a single company that opposes legislation, and he runs around saying Wall Street's opposing this. Just because you oppose his legislation doesn't mean you oppose legislation. I think it's unconscionable." In his speech yesterday, the President urged the industry to "join us, instead of fighting us in this effort," and he lambasted the financial industry for "descending on Capitol Hill...spending millions to influence the outcome of this debate. We've seen misleading arguments and attacks that are designed not to improve the bill but to weaken or to kill it." "Strong Banks Want Strong Regulation"
The financial industry is lobbying to change several provisions in reform legislation that the Senate is taking up. Among other things, the industry objects to a proposed new tax on it to recoup the cost of the financial bailout, limits on banks' ability to trade for their own accounts and a $50 billion fund that would be collected from institutions with at least $50 billion in assets to fund resolutions of failed firms. The resolution fund is a major sticking point between the Senate's Republicans and Democrats. President Obama maintained in his speech yesterday that the fund would "protect the financial system and the broader economy and American taxpayers in the event that a large financial firm begins to fail." There's currently no process that would contain failures such as Lehman Brothers last year, the President said. Speaking on Bloomberg TV yesterday, Barclays (BCS) President Bob Diamond, who attended the President's speech, was more favorable to Obama. "I thought [it] was a very solid speech," Diamond said. "We're very close on a number of key issues to agreement," he said, adding, "Strong banks want strong regulation." The U.S. Chamber of Commerce, which has been very active in opposing a number of Obama's proposals in the legislation, was also conciliatory toward the President, but the organization continues to call for major changes in the bill. Tom Quaadman, executive director of the Chamber's Capital Markets Center, says it's "a good thing [that] he left a lot of the populist rhetoric in Washington," at least compared to other speeches the President has given. There needs to be bipartisan agreement on the legislation, says Quaadman. "The important part here is that we need to have a good bill. A bill for its own sake isn't worth the effort."